Have you seen a Choose Life license plate on the road? Do you have one on your vehicle? If not, please consider making the switch. 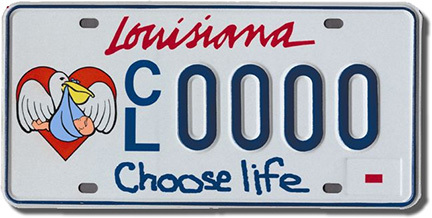 For each Choose Life license plate issued by the state of Louisiana, $25 goes to agencies working with mothers considering adoption for their unborn child. The Louisiana Choose Life License Plate program, managed by Louisiana Right to Life, has distributed more than $450,000 to pro-life pregnancy centers, adoption agencies and other family organizations since its inception in 1999, despite a very bumpy start. Before the license plate even went into production, the New York Center for Reproductive Law and Policy filed a lawsuit to stop distribution of the plate. In late 2002, after that attempt failed, the plates finally went on sale. But just months later, in mid-2003, a federal judge stopped the sale of all specialty plates in Louisiana. Finally, in 2006, the Louisiana Department of Motor Vehicles began selling all specialty plates again, including the Choose Life plate. And thanks to sale of those plates since then, grants have been awarded regularly since 2008. That year 10 agencies split $20,000. In 2018, 21 qualifying agencies received grants totaling $36,750. According to the state statute, 50 percent of the money organizations receive must be used to provide for the material needs of expectant mothers considering adoption, such as clothing, housing, medical care, food, utilities and transportation. The remaining money can be used for counseling, training and providing pregnancy testing. While the women helped with grant money are thinking about adoption, some ultimately choose to parent, thanks to the love and support they received from the agencies supported by the Choose Life grant. Will you help these and other agencies by getting a Choose Life plate?